PA head says he will present a diplomatic solution next week which Washington will probably not like - but which he will insist on. 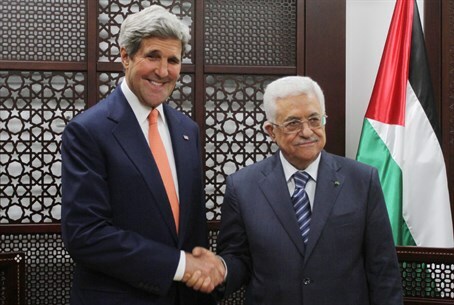 Palestinian Authority (PA) Chairman Mahmoud Abbas revealed on Sunday that he intends to submit a "surprising" diplomatic solution to the "Palestinian issue" to US Secretary of State John Kerry sometime next week. According to Abbas, who spoke in an Egyptian television interview as cited by Haaretz, over the course of next week he will submit an "unusual" diplomatic initiative or proposal. The PA chairman added that his "surprise" will not consist of a declaration of war against Israel; Abbas's Fatah faction's "military wing," the Al-Aqsa Martyrs' Brigades, already declared "open war" on the Jewish state late last month. Instead, Abbas said it would be a diplomatic solution that he would present during Kerry's visit to the region next week, after first presenting it to the various branches of the Palestinian Arab leadership, reportedly on Tuesday. The US will likely not receive the proposal warmly, but it enjoys wide Arab support according to Abbas, who said he would insist on its implementation. He added that it addresses the international and internal spheres of the conflict. It is possible that an appeal against Israel to the International Criminal Court, which Hamas recently signed up to join, might be part of the international initiative; such a move would leave the PA and Hamas open to trial as well. Along those same lines, Abbas's plans may involve a recently proposed UN Security Council resolution which would place the PA in charge of Gaza, and return Israel to peace talks based on the 1949 Armistice lines. Abbas's statements come after he met with Egyptian leaders, including Egyptian President Abdel Fatah al-Sisi, while accompanied by a delegation in Cairo. There they discussed the Egyptian truce proposal, which Abbas's PA along with Hamas and Islamic Jihad amended to include a demand for terrorist releases, along with other key changes, before Hamas breached the ceasefire and talks broke down last Tuesday. Pressure has been rising between Abbas and his unity partner Hamas; last Thursday and Friday he met with exiled Hamas leader Khaled Mashaal in Qatar. Sources said Abbas is 'forcing' Mashaal to return to truce talks, citing the need to keep the Palestinian 'unity government' intact. The fallout, despite the April unity pact between Fatah and Hamas, comes after a gag order was lifted last Monday exposing that Hamas from its Turkey headquarters tried to stage a coup against Abbas in Judea and Samaria, only to be foiled by the IDF and Israel Security Agency (ISA). While Abbas's PA is generally touted as a "moderate" alternative to Hamas, it is worth noting that Fatah this month announced a full return to terrorism, calls that have already been acted on in several shooting attacks. Likewise, the group recently falsely claimed to have murdered 11,000 Israelis, and has called for the ethnic cleansing of Jews from Israel. Senior PA official Jibril Rajoub, a close confidante to Abbas, said two weeks ago that the PA made a "political decision" to support Arab terrorists "slaughtering" Jews living in Judea, Samaria and eastern Jerusalem. The statements are in line with the Palestine Liberation Organization (PLO) charter of 1968, which declares "armed struggle is the only way to liberate Palestine." Following the charter, the PLO and Fatah were defined internationally as terror organizations, a status which was removed during the 1993 Oslo Accords process.